DID you know that there are so many uses for Coconut oil? Even for our furry friends. Luckily, all our sprays are infused with coconut oil with every squirt! Benefits for coats to paws! We recommend Sally's Sweet Geranium, deters fleas and ticks - oh smells so good! Go to the link below to purchase! Get 10% off today! Yes, coconut oil is fantastic for dogs. Now even Fido can enjoy the amazing benefits of coconut oil! Any of the benefits humans get from consuming coconut oil are the same for your pup. This is great news for your dog, since it gives them the same opportunity to heal using natural methods and products (instead of prescription drugs from the vet that can have serious side effects). Coconut oil contains two fatty acids—lauric and caprylic acid—which have strong antibacterial and antimicrobial properties. Both have been shown to inhibit the growth of bacteria colonies while also disrupting the cell membranes of microbes to weaken them (1). This is great news for dogs, as rummaging out in the yard and playing with other pups causes them to inevitably be exposed to all kinds of bacteria. The soothing fatty acids found in coconut oil can also help moisturize and calm your dog’s itchy skin. Specifically, it can help heal conditions like atopic dermatitis and eczema by moisturizing the skin and driving out harmful bacteria (2). Because of coconut oil’s moisturizing and skin-nourishing properties, it’s also excellent for giving your dog a shiny, healthy coat. There’s nothing worse than wanting to cuddle up with your furry friend yet be unable to stand the persistent, wet-dog smell. Luckily, coconut oil’s monolaurin content can help get rid of bacteria on dogs’ skin and coat, which can help neutralize odors (3). Coconut oil has been shown in studies to be very effective at healing all kinds of wounds. It does this by increasing the production and linking of collagen fibers—the main component of skin (4). As a bonus, rubbing it on bites and scratches will also help reduce the chance of infection due to its antibacterial properties. Coconut oil is made up almost entirely of medium-chain fatty acids (MCTs), which are metabolized differently from other types of fatty acids. MCTs are the favored fuel source of cells’ mitochondria, or energy centers, which means they will be readily burned for energy (5). If you find your dog is more lethargic than normal, try adding coconut oil to his or her food for an energy boost. Coconut oil also contains anti-inflammatory and antioxidant properties that have been shown to be effective at reducing symptoms of arthritis (6). Not to mention, the increase in fatty acid intake from consuming coconut oil is great for lubricating the tendons and joints. Monolaurin, a form of the natural antimicrobial compound lauric acid found in coconut oil, has been shown to also have antifungal properties (7). Whether your pooch is dealing with an intestinal yeast problem or a topical fungus, try feeding and applying coconut oil to help get rid of it faster. 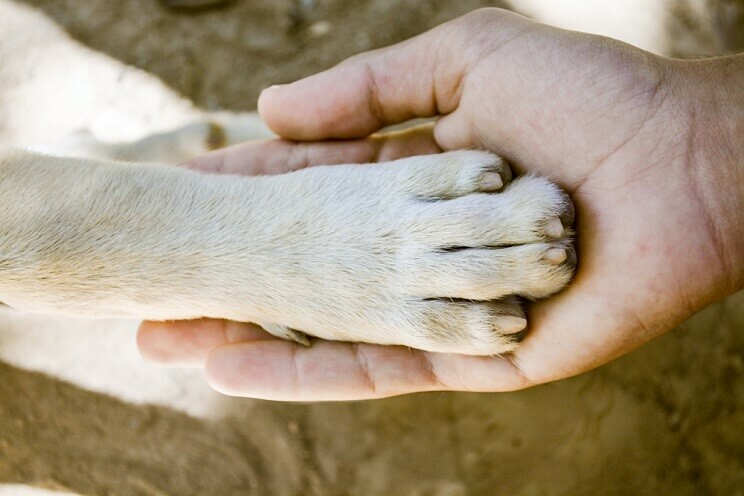 Sometimes the pads of your dog’s paws can become dry and cracked, similar to human knees and elbows. If left untreated, these cracks can become infected after blistering. Coconut oil can provide a double-whammy of moisture and protection from infection, much like a natural Neosporin (8). Parasites are a common problem for humans and dogs alike. In fact, we often pass them to one another without knowing it. The lauric acid in coconut oil can help kill the parasites that are being spread around. It has been shown to be effective against many parasite strains, including one of the most common, Giardia (9). Coconut oil has been shown in several studies to help reduce fat and prevent weight gain. This could be because coconut oil’s medium-chain fatty acids (MCTs) are metabolized differently than other fatty acids, going straight to the cells to be used as energy, rather than immediately stored as fat (10). If you find your pooch is gaining a little pudge, coconut oil just might be a way to prevent more weight gain and help them drop a couple pounds. Coconut’s anti-inflammatory, antibacterial, antimicrobial, and antiviral properties make it well-equipped to help improve a wide variety of intestinal disorders. Stomach bugs don’t stand a chance against its lauric and caprylic acids, while its ability to lubricate and soothe inflammation help treat inflammatory disorders (11, 12). 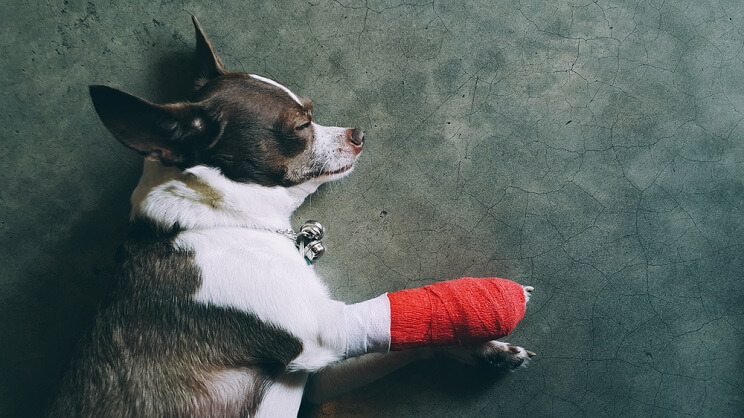 If your dog has had a recent injury, or is suffering from sore, swollen joints or paws, you might want to try feeding them coconut oil. Studies have found that the antioxidants and acids in virgin coconut oil have significant anti-inflammatory effects, helping to reduce arthritis symptoms as well as swelling and irritation (13, 14). Studies have shown that mice fed medium-chain fatty acids (which are abundant in coconut oil) experience “reduced adiposity” and better glucose tolerance than those fed other types of fat (15). Since obesity and lowered glucose tolerance are pathways to diabetes, researchers regard coconut oil as a promising ingredient to help prevent it. 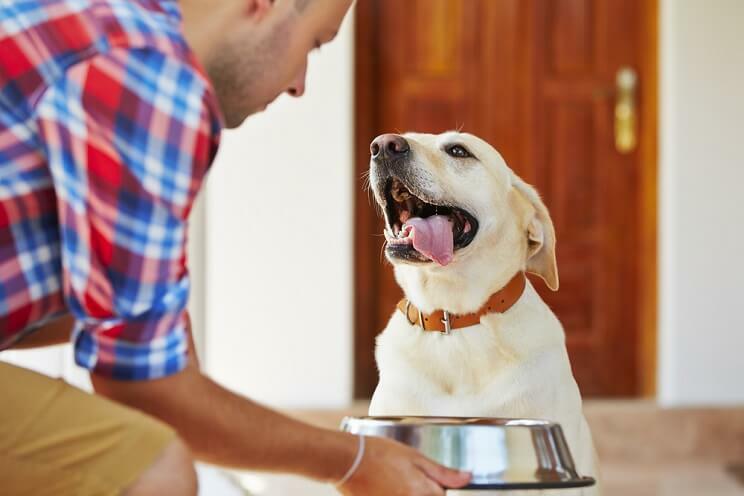 Along with adding a teaspoon to your dog’s food, you might also want to consider switching dog food brands to a more natural brand (filled with foods canines are meant to eat, like meats, veggies, and berries). Many dog foods are nothing but corn, soy, and wheat, which can further damage your dog’s metabolism and could be the root cause of his or her diabetes. 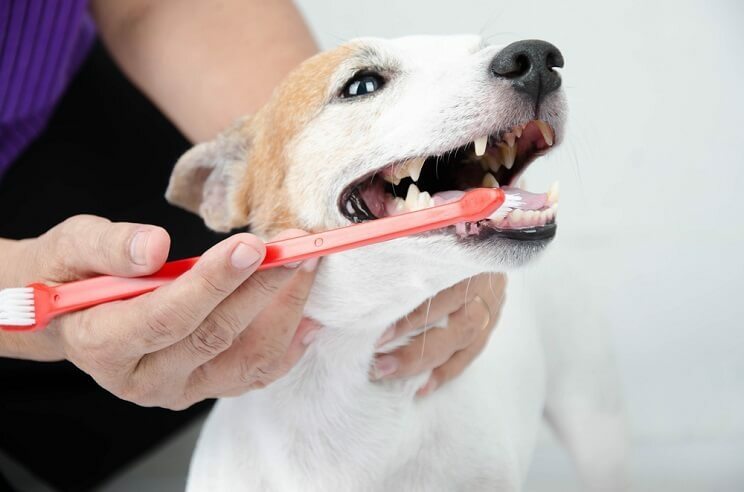 Wondering which type of toothpaste would be best to clean your dog’s teeth? Just grab a dab of coconut oil instead! Coconut oil’s fatty acids will help remove bacteria along the gumline while also helping to get rid of bad doggy breath, often caused by excess bacteria in the mouth (16). While coconut oil cannot be expected to kill off all of your dog’s fleas on contact, many have reported that the lauric acid content of coconut oil can act as a mild flea repellant. 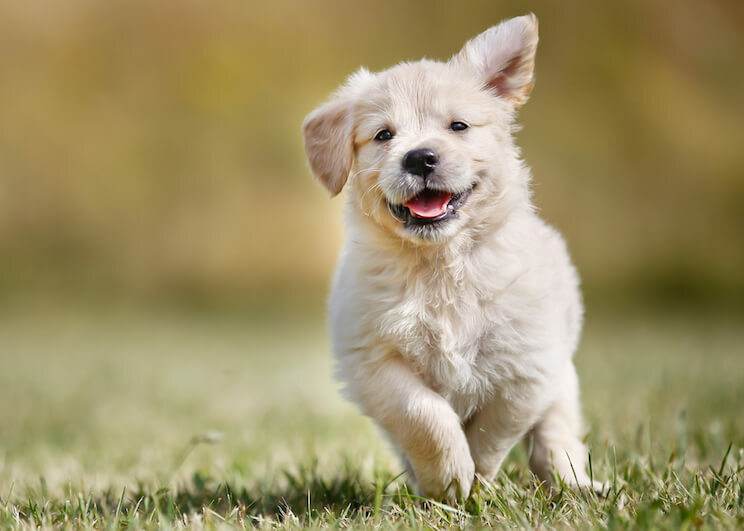 Due to its ability to also heal and reduce irritation of flea bites, it would make an excellent addition to any type of flea treatment as well. Along with its antibacterial properties, coconut oil is also a strong antiviral. Much of its antiviral properties come from the monolaurin produced from its lauric acid content, which has a disruptive effect on the cell membranes of microbes (17). In this way, coconut oil can help treat kennel cough and other viruses plaguing your pooch. Coconut oil’s fatty acids are continuously being researched for their ability to help improve brain health. In one particular study, scientists found that medium-chain fatty acids lead to immediate improvement in brain function in Alzheimer’s patients. One reason for this may be due to coconut’s unique ability to form substances called ketones, which the brains of Alzheimer’s patients can readily use for energy (18). The lauric and caprylic acids found in coconut oil help fight off any invaders that challenge your pup’s immune system: think viruses, bacteria, and fungi. Combine this with coconut oil’s anti-inflammatory properties and you have a reliable immune booster for your dog in your kitchen cabinet (19). 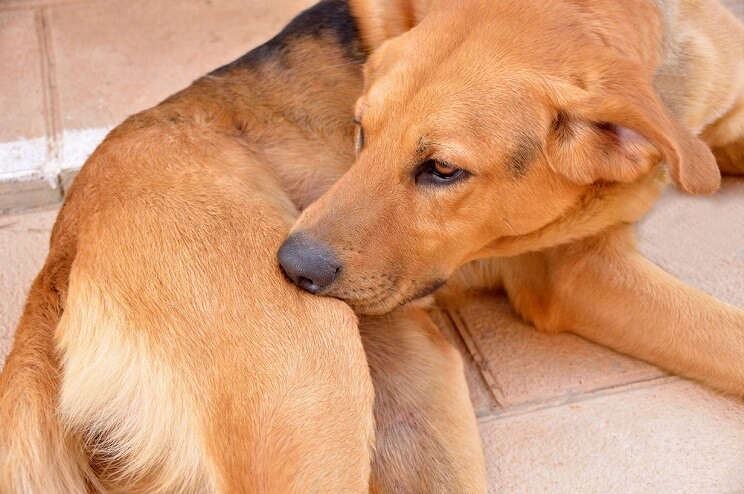 “Hot spots” often develop on dogs when they itch or lick an irritated area raw. This creates an exposed wound that is ripe for infection and inflammation. Coconut oil can help heal these faster, both by applying it topically to the spot and having your dog consume it. It will help reduce the inflammation around the area, kill any bacteria that could be making it worse, and help heal the wound itself (20, 21). What Kind of Coconut Oil Is Best? Cold-pressed, extra virgin coconut oil is the best coconut oil for dogs (and you!). Cold-pressed means the coconut is never heated, preserving its delicate enzymes, while extra virgin ensures the oil undergoes as little processing as possible. How Much Coconut Oil Should I Give My Dog? The general dosage is 1 teaspoon per 10 lbs of bodyweight, per day. However, it’s best to start off with ½, or even ¼, of this amount and work the dosage up to avoid loose stools.